Harvard Book Store welcomes award-winning writer TAYARI JONES—author of Silver Sparrow, Leaving Atlanta, and The Untelling—for a discussion of her latest novel, An American Marriage. She will be joined in conversation by Tufts English professor CHRISTINA SHARPE. Christina Sharpe is a Professor at Tufts University in the department of English and the programs in Africana and Women's, Gender, and Sexuality Studies. Her second book, In the Wake: On Blackness and Being, was published by Duke University Press in November 2016 and was named in the Guardian newspaper and The Walrus as one of the best books of 2016. In the Wake was a finalist for nonfiction for the Hurston/Wright Legacy Awards. Her first book, Monstrous Intimacies: Making Post-Slavery Subjects, was published in 2010, also by Duke University Press. Tayari Jones is the author of four novels, including Silver Sparrow, The Untelling, and Leaving Atlanta. Jones holds degrees from Spelman College, Arizona State University, and the University of Iowa. She serves on the MFA faculty at Rutgers and blogs on writing at www.tayarijones.com/blog. She lives in Brooklyn. An Associate Professor in the MFA program at Rutgers-Newark University, she is spending the 2017-18 academic year as the Shearing Fellow for Distinguished Writers at the Beverly Rogers, Carol C. Harter Black Mountain Institute at the University of Nevada, Las Vegas. 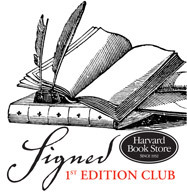 Harvard Book Store's Signed First Edition Club is a unique way for readers to connect with and create a wealth of great books. Each month, Harvard Book Store offers members a signed first edition of a newly published book, selected for both its literary merit and potential collectibility. Learn more and sign up at harvard.com/signedfirst.